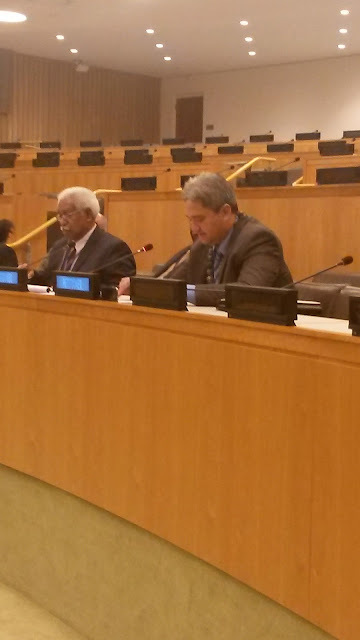 Thank you for the opportunity to address you on the question of Ma'ohi Nui/French Polynesia. I speak in my capacity as an elected member of the House of Assembly of French Polynesia from the Group “Union Pour La Démocratie” (U.P.L.D.) led by H.E. President Oscar Temaru. I join with President Temaru in extending our warmest regards to the member States. We regard with the utmost seriousness the obligation the international community has accepted by adopting consensus General Assembly Resolution 67/265 on 17th May 2013 re-inscribing our territory, following more than 60 years of omission from the list. The intense effort and sacrifice we exerted in gaining our re-inscription is indication of our commitment to the full compliance with the United Nations Charter, and full implementation of decolonization resolutions, while recognizing that these mandates are only as good as their implementation. We make specific note of Article 73(b) of the Charter which obligates the administering powers to prepare the territories for full self-government, and Article 73(e) of the Charter which requires compulsory transmission of accurate information to the U.N. on our territory, which has not been transmitted since our re-inscription in 2013 1/. As we have observed before, if countries are allowed to pick and choose which parts of the U.N. Charter they would implement, and which parts they would not, then their aggressive claims of adherence to the international ‘rule of law’ in other circumstances ring particularly hollow. In this case, recent pronouncements by administering power officials reflect a continual denial that our current political status is non self-governing, and they engage in an ongoing strategy to project the dependency status as a self-governing democracy. We advised this Committee in 2014 of the independent "Assessment on the level of self-government of French Polynesia" which analyzed the inconsistencies of our dependency status with international principles of self-government. The study provided critical political analysis unavailable to member States, and we ask this committee to have the updated Self-Governance Assessment published as a document of the General Assembly. We also take specific note of various General Assembly directives given to the U.N. system to implement decolonization resolutions. In this regard, due attention should be given to the reasons why the U.N. machinery may not have carried out these directives 25 years on from the beginning of the first International Decade for the Eradication of Colonialism. While we appreciate the several Secretary-General reports on the implementation of the decolonization mandate, the conclusions do not address the reasons for the inadequate implementation. 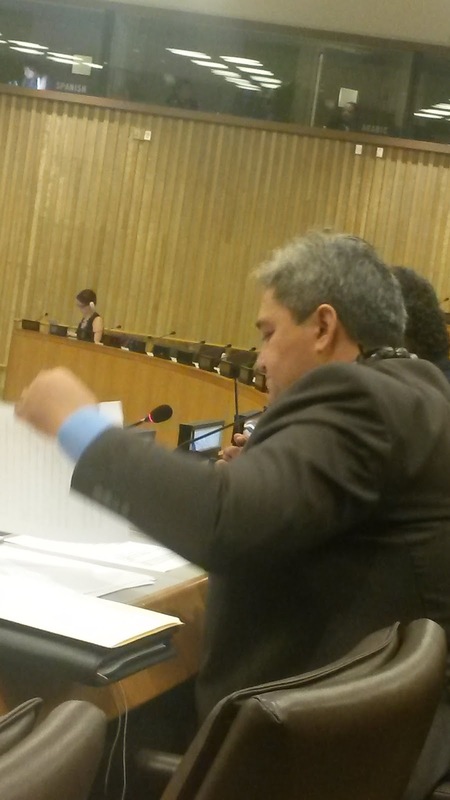 In this connection, of particular relevance to French Polynesia/Ma'ohi Nui, is the repeated call for a case-by-case work programme, in conjunction with the administering power, to facilitate the implementation of the decolonization mandate. Since our administering power has not seen fit to comply with its Article 73 (e) obligations, it can only be concluded that there would be no compliance with any case-by-case work programme. Rather than assume that such a work programme cannot be undertaken for French Polynesia, we ask this committee to return to the language of earlier resolutions adopting the case-by-case approach that do not require an initial role of the administering power (A/Res/54/91). The international community has made historic efforts to end the scourge of nuclear testing with the entering into force of the bilateral Nuclear Test Ban Treaty (1963) and the comprehensive Nuclear Test Ban Treaty (1996). These efforts were directly relevant to Maohi Nui/French Polynesia since our people were the victims of 193 atmospheric and underground nuclear tests over a thirty-years period ending in 1996. These tests discharged the total power equivalent of 720 Hiroshima bombs in the atmosphere, and the equivalent of 210 Hiroshima bombs underground. One does not have to be a nuclear scientist to conclude that the health and other humanitarian consequences of these inhumane experiments have been devastating to our people. 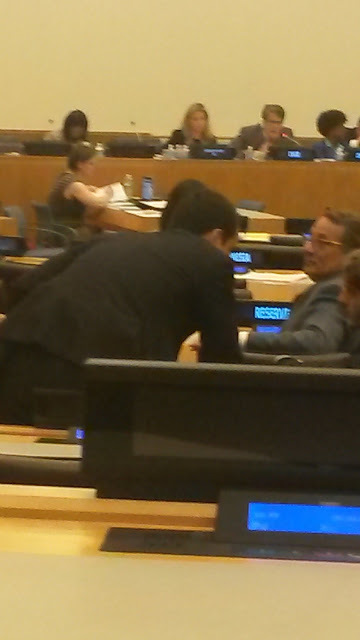 As former President of French Polynesia, Hon. Oscar Temaru, told the Pacific Islands Forum in 2011, "our people are dying of several nuclear related illnesses that are bound to be passed to many generations to come." We take note of General Assembly Resolution 68/93 which called for the Secretary-General to conduct a report "on the environmental, ecological, health and other impacts as a consequence of the thirty year period of nuclear testing in the territory," and Resolution 69/103 which took note of the required report which was curiously published a month after the end of the 2014 session of the C-24, thus not permitting any discussion of its findings. It was left to us to record in our statement to the Fourth Committee last October that the Secretary-General's Report was "far from comprehensive, and is rather a compilation of replies from just two U.N. agencies out of some 22 requests for information. Of these replies was a reference to an outdated 1996 International Atomic Energy Agency (IAEA) study which said that the impact to the health of the Ma’ohi people was negligible”. This finding has been proven to be grossly premature. A subsequent document of the U.N. Scientific Committee on the Effects of Atomic Radiation quite properly found “that the testing of nuclear weapons in the atmosphere involved unrestrained releases of radioactive materials to the environment locally, regionally and globally (depending on the altitude of the explosion), causing the largest collective dose thus far from manmade sources of radiation." A stakeholder statement presented to the 2013 Human Rights Council Universal Peer Review of France concluded that 17 years after the last French nuclear test was held in the Pacific, our people are still "living with the legacy of hundreds of nuclear tests." In effect, Mr. Chairman, the 2014 Secretary-General's Report barely scratches the surface, and this is illustration that more attention must be given to the substantive quality of such reports which have their genesis in the C-24. Instead, the report in question fails to address the impacts experienced today by thousands of our people who have yet to be given reparatory justice for this blatant disregard of humanity perpetuated upon them. Fortunately, we can draw attention to the publication of the Independent Report on French Nuclear Testing in French Polynesia completed in 2014 by renowned French scientist Bruno Barrillot that provides a comprehensive analysis of the impacts of nuclear testing. We ask this Committee to advance its publication as a document of the General Assembly for the consideration of member States in order that they can have a more complete picture. 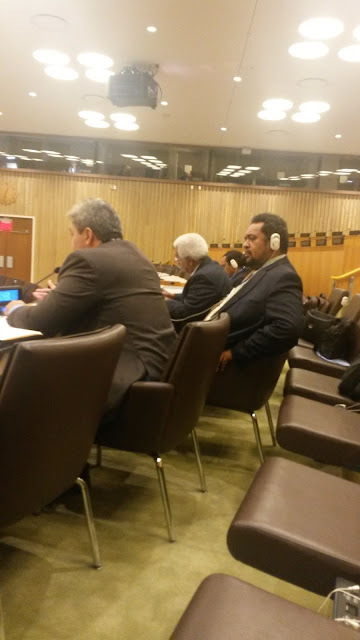 Owing to the clear evidence of the impacts of this nuclear testing, we requested the Fourth Committee last year to include in the French Polynesia resolution the recommendation that the U.N. Scientific Committee on the Effects of Atomic Radiation consider our inclusion in that committee's programme of work. We recognized, however, that such amendments to draft resolutions at the Fourth Committee are rarely facilitated, and given that our statement today comes on the final day of the C-24 session, it would be logical to conclude that our recommendations would not be integrated into the draft resolution today. In this connection, we ask you to amend your method of work to allow for the question of French Polynesia to be considered in the first week of the Special Committee session to ensure that relevant information brought to you can be reflected in the text, especially given that much of it is not included in the working Paper. Another key omission from the U.N. documentation is the historical adoption of a resolution last November 2014 by the elected members of the Assembly of French Polynesia calling upon France to acknowledge the colonial nature of its nuclear testing programme over the thirty years of military occupation of the atolls of Moruroa and Fangataufa where the testing was primarily conducted, and which France continues to hold. The resolution creates an expert committee to assess and evaluate the financial damages caused by the occupation. This was also curiously omitted from the Working Paper - perhaps because the administering power opposed any such reference. The General Assembly has adopted a host of resolutions confirming that the ownership, control and permanent sovereignty of natural resources, including marine resources, lies with the peoples of the non self governing territories as part of their heritage. The Memorandum made the point that "...the legal nature of the (territories') permanent sovereignty over natural resources... is indisputably part of customary international law." U.N. resolutions have also affirmed that the exploitation and plundering of these resources by foreign economic interests is in violation of relevant U.N. resolutions, and is a threat to the territories' integrity and prosperity. Resolutions further emphasized that any administering Power that deprives the peoples of these territories of the exercise of their legitimate rights over their natural resources violates the solemn obligations it has assumed under the U.N. Charter. Notwithstanding these clear precepts of international law, the administering power continues a process of usurping the marine resources of our people under the aegis of its successive Organic Laws unilaterally applied to us. Accordingly, the access, ownership and rights of the Ma’ohi People of French Polynesia to its 5 million square kilometers of Economic Exclusive Zone of deep ocean is illegally under the full control of the administering power which claims our resources as 48 % of the French maritime zone. The resources include the vast array of “strategic metals” such as rare earths, manganese, cobalt, and more. Further unilateral exploitation occurs by other means. Revenue in the form of fees paid by more than ten airlines to land at our own Tahiti International Airport goes to the French treasury, not to our own. Even taxes from our own Air Tahiti airline are paid to France, along with fees paid to cross through our airspace. Under this dependency political status, we cannot control our borders as this function is in the control of the administering power. Thus, we have no authority to issue visas to enhance our tourism industry. Fees associated with geostationary satellites that cross our spatial area, the telecommunications system including few fiber optic cables crossing our ocean seabed, and many more revenue generating competencies are controlled by the administering power in a political status which they mis-characterize as 'autonomy' - but which is the essence of contemporary colonialism. In short, the extent of competencies controlled by the administering power is dominant when compared to those few under the authority of the local elected government. It is little wonder, then, that the administering power shuns the U.N. process with respect to Maohi Nui/French Polynesia since they would be hard pressed to justify such blatant colonialism. But this will not delay the realization of our inalienable right to self-determination. We therefore call on this Committee to take a proactive approach by beginning a case-by-case work programme for Maohi Nui/French Polynesia, and invite the administering power to come to the table. The right of the Maohi People to self-determination will not be thwarted by such strategies clearly designed to stall the process. 2/ See United Nations General Assembly Resolution 1803 (XVII) of 14 December 1962. Stephen Allen is a Senior Lecturer in Law at Queen Mary, University of London. In 1965, the UK excised the Chagos Islands from the colony of Mauritius to create the British Indian Ocean Territory (BIOT) in connection with the founding of a US military facility on the island of Diego Garcia. Consequently, the inhabitants of the Chagos Islands were secretly exiled to Mauritius, where they became chronically impoverished. This book considers the resonance of international law for the Chagos Islanders. It advances the argument that BIOT constitutes a 'Non-Self-Governing Territory' pursuant to the provisions of Chapter XI of the UN Charter and for the wider purposes of international law. In addition, the book explores the extent to which the right of self-determination, indigenous land rights and a range of obligations contained in applicable human rights treaties could support the Chagossian right to return to BIOT. However, the rights of the Chagos Islanders are premised on the assumption that the UK possesses a valid sovereignty claim over BIOT. The evidence suggests that this claim is questionable and it is disputed by Mauritius. Consequently, the Mauritian claim threatens to compromise the entitlements of the Chagos Islanders in respect of BIOT as a matter of international law. This book illustrates the ongoing problems arising from international law's endorsement of the territorial integrity of colonial units for the purpose of decolonisation at the expense of the countervailing claims of colonial self-determination by non-European peoples that inhabited the same colonial unit. The book uses the competing claims to the Chagos Islands to demonstrate the need for a more nuanced approach to the resolution of sovereignty disputes resulting from the legacy of European colonialism. Puerto Rico remained locked in a cycle of poverty, brain drain and sluggish economic development caused by the “imperialist” policies of the United States, the Special Committee of 24 was told today as it heard from more than 30 petitioners on the matter and approved a resolution urging the United States to allow Puerto Ricans to exercise their inalienable right to self-determination. Welcoming advocates from both Puerto Rico and its Diaspora community, the Special Committee — known formally as the Special Committee on the Situation with regard to the Implementation of the Declaration on the Granting of Independence to Colonial Countries and Peoples — heard that more than half of the island’s population lived in poverty, owing in large part to crippling trade policies imposed by the United States, the “colonial Power”. Despite having been removed from the United Nations list of Non-Self-Governing Territories in 1953, Puerto Rico remained very much a colony of the “Yankee empire”, petitioners stressed, calling for the island’s independence from the United States. 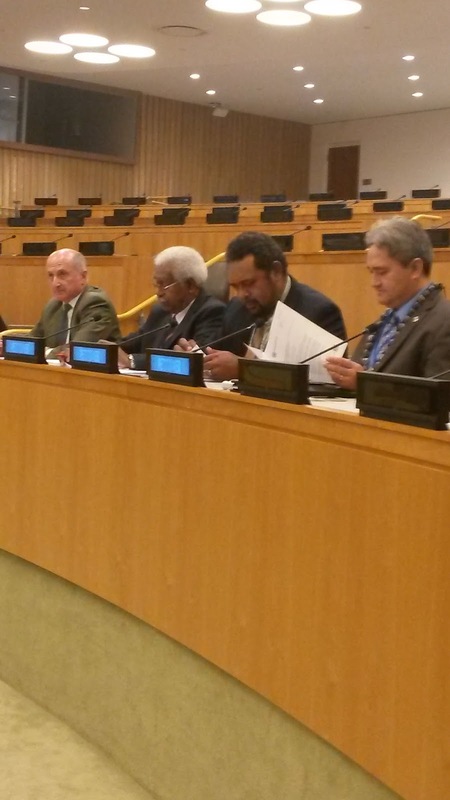 In that vein, the representative of the Frente Autonomista urged the United Nations General Assembly to take action to ensure that the United States met its international obligations with regard to colonialism and took responsibility to decontaminate the Puerto Rican territory. Calling on that country to commit itself to a decolonization process, he demanded that all States help Puerto Rico with its economy and “stand on the right side of history”. “This is an imperial situation,” asserted the representative of the American Association of Jurists, noting that the Territory was unable to establish trade relations with other countries, to the detriment of its economy. The “commonwealth” status hid the real situation of Puerto Ricans, which should be energetically condemned, he said. The representative of the Movimiento Puertorriqueño Anticabotaje said that certain legal and trade restrictions — which had been put in place to stimulate American industry in Puerto Rico — constituted a “wall” that blocked economic development on the island. “We need access to markets which will make the flow of raw materials to the world at competitive prices possible,” she said. The island’s economy had deteriorated in recent years, said a representative of Frente Socialista de Puerto Rico, noting that half the population lived at the poverty level. Imported foods were required, which led to poor diets and high rates of non-communicable diseases. Meanwhile, the United States Government maintained the designation of “domestic terrorism” for Puerto Rican activists, such as Oscar Lopez Rivera, who had been held for more than three decades in American prisons. Mr. Lopez Rivera — who had been convicted of seditious conspiracy in the United States — was a central figure in today’s discussion, with many speakers calling for his immediate pardon and release. “He is a living legend in Puerto Rico,” said the representative of the National Lawyers Guild International Committee, adding that “the clamour for his release is a unifying factor, a call for justice and human rights across party lines, national boundaries, and religious and political beliefs”. Among today’s petitioners were those who sought, not independence, but equality under United States law as the nation’s fifty-first state. “We have a half-way democracy,” said the representative of the group Igualdad, noting that, in a 2012 referendum, more than half of Puerto Rico’s voting population had rejected the island’s current status. In the United States, Puerto Rico was not represented at the federal level except for a resident commissioner who had no voice, she added. Others stressed that the most basic right of citizenship — the right to vote for President — was still denied to more than 3.5 million Puerto Ricans. The representative of the Coalition for the Presidential Vote in Puerto Rico said that thousands of Puerto Rican soldiers had sacrificed their lives in every major war waged by the United States in defence of “freedom” and “democracy”, and yet they were denied the right to vote for those that governed them. “This harsh reality contradicts the United States’ public international discourse when it self-proclaims itself as the beacon of freedom and democracy worldwide,” he said. Also participating today were representatives of Iran (on behalf of the Non-Aligned Movement), Cuba, Ecuador (on behalf of the Community of Latin American and Caribbean States), Venezuela, Bolivia, Nicaragua and Syria. NAHA, OKINAWA PREF. – Ruling parties in the Okinawa Prefectural Assembly have submitted a draft ordinance that is apparently aimed at preventing landfill work off the Henoko coastal district in the city of Nago in a bid to block the transfer of the U.S. Futenma base to the area. The ordinance, to be put to a vote next month, will likely be approved with majority support, including from the Social Democratic Party and the Japanese Communist Party. It is expected to take effect Nov. 1. The draft calls for restricting the transportation of sand used for reclamation into Okinawa from outside the prefecture. The stated aim is to prevent alien species from getting into Okinawa of alien species via the sand, according to the parties. The ordinance would require companies to submit sand transportation plans in advance and take measures to ensure that no invasive species is included. The governor of Okinawa would be authorized to order the cancellation of such plans if necessary. “We need to pass Okinawa’s beautiful nature to future generations at a time when a plenty of sand for reclamation is planned to be carried into the prefecture,” Satoru Nakasone, an assembly member from the SDP, told Tuesday’s meeting of the assembly. At a news conference in Tokyo on Tuesday, Chief Cabinet Secretary Yoshihide Suga said he will carefully watch the course of debate on the ordinance. “I expect the Okinawa assembly will shed light on why the ordinance only targets sand used for reclamation,” he said. U.S. Marine Corps Air Station Futenma, situated in a densely populated area in the city of Ginowan, is slated to be relocated to the Henoko area under agreements between the Japanese and U.S. governments. Many people and political leaders in Okinawa are opposed to keeping the base within the prefecture. A court here ordered the central government to pay 754 million yen ($6.1 million) to residents for their suffering caused by noise pollution from the U.S. Marine Corps Air Station Futenma in Ginowan, Okinawa Prefecture.